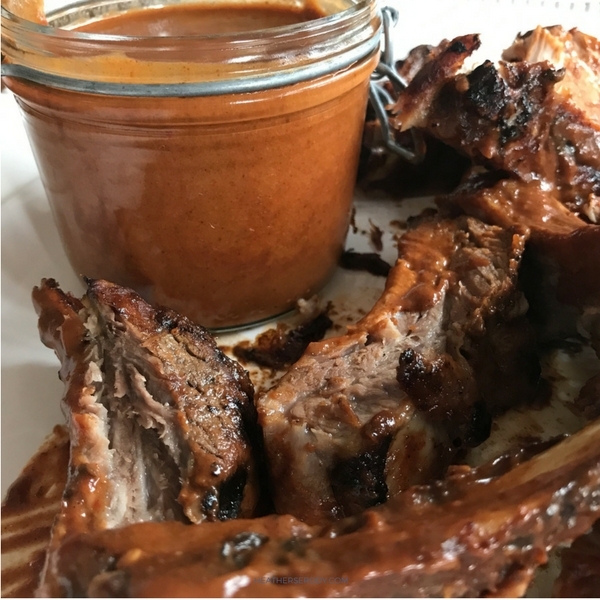 I've figured out how to make grilling ribs no problem by creating a sugar-free, gluten-free, low-carb BBQ sauce. It's got a nice smoky maple flavor with a kick of vinegar and a touch of heat. 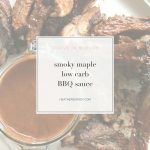 I sweetened it with Yakon Syrup, which is a must-have for low-carb lifestylers, but you can also use liquid stevia if you prefer that. Yacon syrup is a natural sweetener derived from the root of the yacon plant. It's been eaten in Peru for hundreds of years. It looks and tastes a lot like molasses. It contains half the calories of sugar, scores very on the glycemic index and it's also a prebiotic that can improve your gut microbiome and immune function. Yacon Syrup does contain a small amount of fructose and natural sugar and therefore can still impact your blood sugar and insulin levels. One tablespoon of Yakon syrup contains 39 calories and less than 9 grams of natural sugar. There are 3 Tbs. of Yakon syrup in this entire recipe of BBQ sauce so the impact per serving is still relatively small. If you prefer to use another type of sweetener, I'd use about 60 drops of natural liquid stevia in place of the Yakon syrup. Place all of the ingredients in a blender and process on high for 30 seconds until smooth. Taste for seasonings and adjust accordingly. Refrigerate, covered. Keeps for up to 2 weeks.